Zelda: Breath of the Wild has released, and now that I’ve finally bested Ganon, I feel like it’s appropriate to start weighing in on the whole game. However, Breath of the Wild is a game that is incredibly open. As far as Zelda titles are concerned, Breath of the Wild offers more freedom than even the original title did. That means that my experience and your experience will be quite different. Along the way, you’ll want to make sure to do a few of these things. Whether for the pure fun, a new perspective, or a leg up on your enemies, the reasons are numerous. Be sure to take a few of my tips into consideration, and I can guarantee you’ll have a rewarding visit through Hyrule. Breath of the Wild was an odd ride for me. I started off interested, then I grew bored. After that, I started disliking the game. It wasn’t until I chilled out and relaxed a bit that I found my enjoyment in the title. For that reason alone, I encourage you to take the first few hours slowly. Sure, you’ll want to start exploring the vast expanse of the map, but spending a bit of extra time in the starting area will do you wonders. Tinker around! Try inventive ways of defeating enemies. Half of Breath of the Wild is trying stuff out and making it work; it’s like a fun little Zelda chemistry set. Having a base understanding of how to approach combat will aid you in the long run, so no time is wasted. Generally speaking, Breath of the Wild is more fun when you’re taking it slow and trying stuff out. Breath of the Wild is a pretty game, there’s no doubting that. It’s like a weird cross of Hayao Miyazaki’s animation style and some of the more recent Zelda entries. While you’re roaming the map, you’ll often find yourself atop high mountains and vantage points. While these provide a great way to lay out the path ahead, they’re also prime for sight seeing. Take in the sights; there’s plenty. While roaming around at your leisure is perfectly okay, don’t ignore the main story path. You can always revisit side missions and other areas after you’ve beaten the main game. 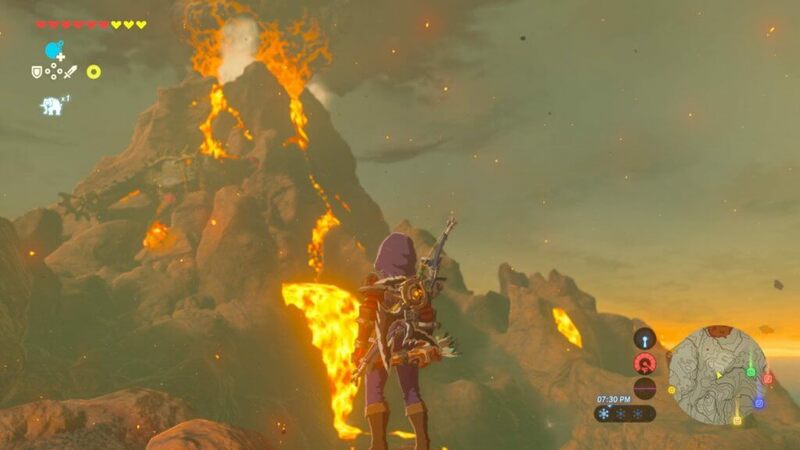 The four major temples of Breath of the Wild all offer an insanely overpowered ability at their completion. While most of them are mainly combat based, there’s one that aids exploration incredibly well. If you’re looking for an easier way to navigate your surroundings, maybe try investigating the northwest side of the map. After the prologue of the game, you’ll be pushed towards an objective. Try to stick to the main road for this bit, as you won’t want to miss the very first horse stable you’ll come across. 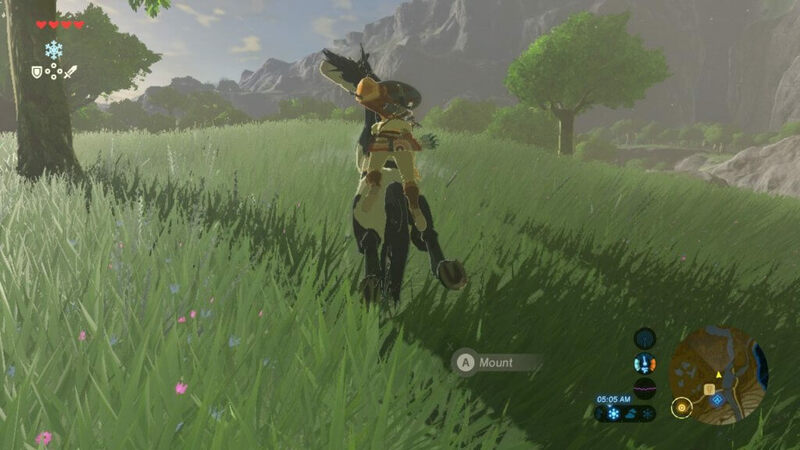 This first stable provides a nice explanation on how mounts work in Breath of the Wild. I won’t spoil the specifics, but you’ll want to grab yourself a horse as soon as you can. Doing this horse introduction will open up more rare mounts in the future, so don’t miss it! I went a little buck wild on exploring, and almost completely skipped this crucial element. 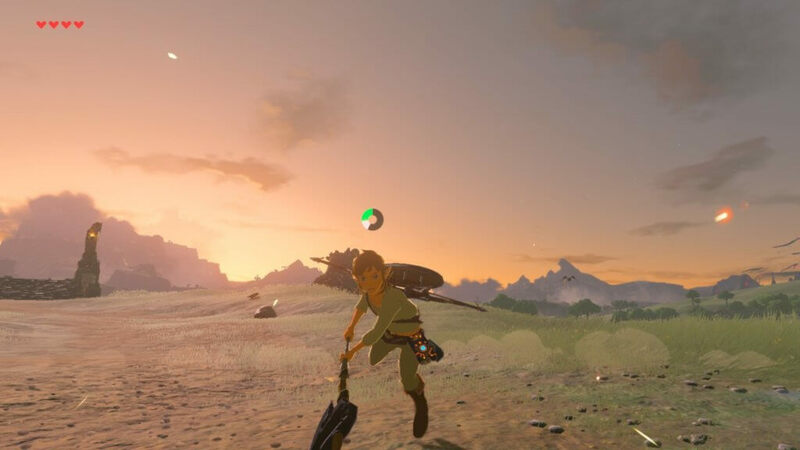 In Breath of the Wild, weapons break faster than a launch Xbox 360. It’s okay though, because experimenting with new weapons is a constant feature. Your weapons will get stronger over time as you find more powerful gear, but they won’t stick around forever. Don’t worry about finding your “main” weapon, rather use everything you have. Sure, you’ll want to save a decent weapon or two for boss fights or temples, but don’t worry about being left empty handed. Breath of the Wild will always make sure you’re not left completely defenseless. There’s more than one HUD option in Breath of the Wild, and while the Pro HUD may not be a feasible way to play the game entirely, it’s a fun addition. Pro HUD strips away all the extra indicators: no temperature gauge, minimap, etc. When you’re taking in the aforementioned sights, throw on Pro HUD. Step One: Run away from enemies when you’re scared, they’ll follow. Step Two: Pull out bomb. Step Four: Watch enemies run right over bomb. For added fun, do this on a ledge or anywhere high up. While it sounds silly, dropping bombs and triggering them seconds later was a crucial tactic that I used while strengthening my gear. It’s an easy way to guarantee escape, finish off enemies, or generally have a good laugh. Finally, remember to have fun. Often times open world games are a lot like a check list. You’ll go from area to area, seeking that 100% completion rate. Breath of the Wild isn’t like that. While there are a ton of things to do, and plenty of secrets to keep you searching, it’s best experienced with cheerful abandon. Let your proverbial hair down and enjoy yourself! If Zelda: Breath of the Wild does anything, it forces you to craft your own experiences and moments. The beauty is in the minute-to-minute experiences, the moments of pure joy and satisfaction. Savor these moments, and don’t sweat multiple deaths or difficulty. Breath of the Wild is a tough game, but it’s also a really great playground to have a ton of fun.